This organ was restored in 2005-6. It can be argued that it is England’s oldest surviving church organ. Although there are older pipes and cases, this is the oldest collection of pipes in their original positions on their original wind chests. It looks as if the organ dates from shortly before 1704-5, when Renatus Harris was paid for the Trumpet and Echos. In 1744 the organ was stored while the new church by George Dance was being built, and was restored by John Byfield the elder, who replaced the Great Larigot and Tierce with a Furniture. The organ was rebuilt by Hill in 1866, Bishop in 1898 and Mander in 1966. Thanks to the Heritage Lottery Fund, which is playing a central role in restoring our classical organ heritage, it has now been restored as far as possible to its original disposition. It had previously been possible to appreciate it in the Mander restoration of 1966. At that time most of the Victorian additions were removed, though more tonal additions were made which in 2006 seem inappropriate, and a mechanism introduced which had started to become unreliable. 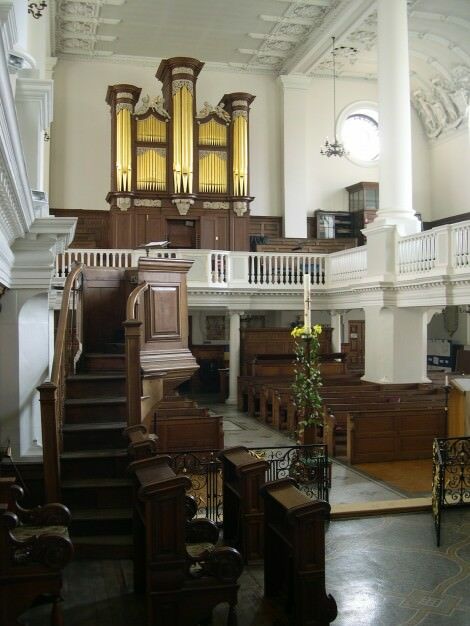 The 2005 restoration project owes a great deal to John Bamford, organist at St Botolph’s, Ian Bell, consultant, and David Francis, project co-ordinator. The case was restored to its original condition; the paint was investigated by Catherine Hassall, the case was painted by Paul Knibb, and the front pipes gilded by Kate Pickin. The asterisks indicate pipes which are largely original. The Furniture has three pipes from the very treble which were re-used elsewhere in the organ when the Furniture was removed. The Great Open Diapason is in the front, the pipes made by a craftsman who had worked for Bernard Smith. The metal stopped pipes (in the Great and Swell Stop Diapasons, and Choir Flute) were all made by the slightly different people. This suggests that Renatus, perhaps under pressure, was drawing on the available pool of self employed craftsmen in London. The Swell/Echos are placed above the two Great chests, which are off-set to the treble and spaced wide enough apart for the key action to pass between them, which suggests that the organ was planned that way, but it does feel like an afterthought. The Great Fifteenth is small in scale, whereas the Sesquialtera is quite wide and contains a Fifteenth, which suggests that there were three registrations for full organ: 1. Open, Principal and Sesquialtera, 2. Open, Principal and Furniture (after 1744) and 3. Open Principal and Fifteenth, a ‘small’ full organ. Before 1744, when the pipes of the Larigot and Tierce were incorporated into the Furniture, there would also have been a variety of mutations making more or less full choruses. Their principal scale would have contrasted with the flute scale of the mounted Cornet. The Chair organ was definitely the ‘soft’ organ, with only one rank of principal scale, and the Bassoon very narrow. The Drum is recorded by Henry Leffler, but the Tremulant is a modern addition. The Pedal organ and its couplers are a compromise. The organ may originally have been set further back, though the size of the wedge bellows (now restored) fill the bottom of the organ, as they may always have done. The galleries were rebuilt during the G.F.Bentley restoration of the church in 1895. Organists are welcome to play the organ; contact the church office on 020 7283 1670, during office hours.